WHEW – It’s been an intense several weeks preparing the new www.oakleystudio.com for launch, and now here it is. When you’re done reading this post, have a look around and then click the “webmaster@oakleystudio.com” link to let me know how you like my new business web site. Don’t be surprised if you find a few broken links, and places where a picture or two could add clarity… Sigh. Yeah, a new web site is never “done” and it won’t ever be “perfect” but eventually you just need to LAUNCH and keep working on it. That’s exactly what I’m doing. Read on to see what’s new. This is not just a new web site. Oakley Studio, LLC is a re-envisioned business with a WordPress-centric focus. Oakley Studio spent it’s first 20 years designing and building custom web sites and hosting them on our own managed web servers. We’ve earned our expertise by providing rock-solid web hosting and professional domain name email services since the earliest days of the World Wide Web. But over the years, custom web site design has become a more and more expensive proposition, especially for the small entrepreneurial businesses that have been our core clientele. It also takes way too long to get a new site up and running. And once it launches, a site owner can’t easily do their own updates and add new content. This was a good thing! It turned many web sites from being little more than glorified online billboards into dynamic evolving communities that could attract a devoted audience. And the early adopters who became “bloggers” and used WordPress to launch their new-found “lifestyle businesses” inspired the WordPress developers to add additional functionality with modular Plugins and Themes. Including some big-name sites like the BBC, The New Yorker, and even Forbes itself. And Oakley Studio! And many of the client web sites we host today. Our first WordPress client web site was built in 2007. Since then I have been impressed with the ongoing WordPress development effort. WordPress is a reliable and friendly workhorse for web publishing. Capable of addressing the needs of any entrepreneur with a good business idea, I am delighted to introduce WordPress to all my new clients. So, new web site, new business focus, what’s new under the hood? We’ve made it easier than ever to launch a new web site. More than a redesign, this new business web site reflects deep changes I’ve made in how services are provisioned for our clients. For some time I have been researching and testing how to assemble a business-centric WordPress Dashboard, both for my own business and as a prototype for other businesses. 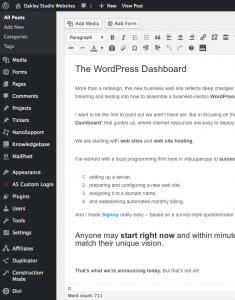 I want to run my business from the WordPress Dashboard, and you can too! By focusing on the WordPress Dashboard experience, the vision for a “Dashboard-centric business” is emerging, where internet resources (domain names, web sites, site hosting, email, and third-party services) are easy to deploy and available within minutes. We’re starting with web sites and web site hosting. and establishing automated monthly billing. 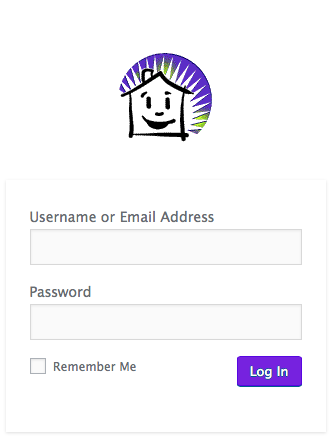 And I made Signup really easy — based on a survey-style questionnaire that gathers all the necessary info to be able to prep each new web site for instant login. Anyone may start right now and within minutes be underway to creating the next new beautiful web site to match their unique vision. Cool cool cool automation! That’s what this post is announcing today. But that’s not all! We are also rolling out a custom Plugin to monitor each site’s uptime, provide traffic analysis, perform daily backups and maintain site security. The “Oakley Studio Admin” plugin allows us to update WordPress source code at all the sites we host, whenever new security updates are issued. We can also update Plugins and Themes across all Oakley Studio client sites. This humble plugin connects all hosted sites with my “Webmaster Dashboard” and provides excellent multi-site monitoring and management. You can think of it as your webmaster’s repair and maintenance bay for web sites. I love it. Any small or home-based business that is going to sell products and services online needs a signing authority digital certification in order to establish end-to-end secure connections for visitors, customers and clients. We include SSL Encryption for any sites that require it for secure credit card transactions or membership sites. We are an experienced ecommerce hosting company and are happy to help you get your online storefront set up and running. 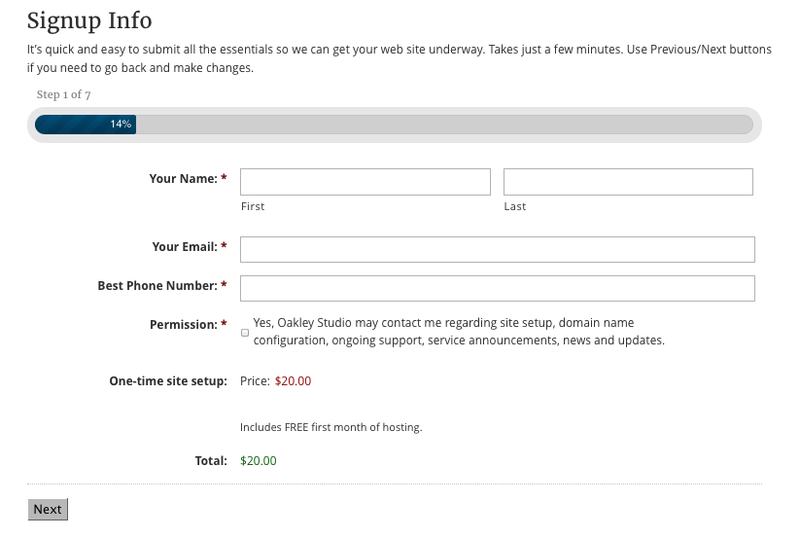 Domain name email service is tightly bound to domain name management, so Oakley Studio handles both services together in our “Webmaster Dashboard.” Our email service has excellent spam and virus filtering and is constantly vigilant against malware. I can provision new domain name email addresses as needed, and manage forwarding to any other email address. Nothing is quite so elegant and professional as using your own domain name email address. 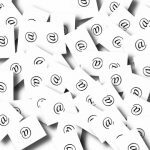 Many of our clients forward multiple domain name email addresses to a single Gmail address for all their business communications. If you like our service we know you’ll tell others. (And we love to “quote” your kind words on our home page too!) We’ve built a basic no-frills affiliate program that awards you commissions for introducing Oakley Studio to others. Word of mouth has always been how Oakley Studio gains new clients, and that hasn’t changed. But now every Oakley Studio client has an added incentive to invite others to establish their web sites here. You have an “Affiliate Dashboard” you can log into for checking account balances and commission statements. These re-envisioned services are available through your Login Account here at Oakley Studio dot com. You may have many “Dashboards” in your work and personal life. We hope your “Oakley Studio Dashboard” plays a prominent role as you build your online presence and offer your business to the world. Please explore a bit and let me know what you think of the new Oakley Studio! For all existing Oakley Studio clients we will be sending you login credentials and instructions so you can begin using our new services soon. We hope you enjoy these initial services and like using them. We have more automation in store to make your WordPress experience a pleasure every day! Of course you can use anything I say to promote your business! This looks just great! Just great! You practiced on me and it’s getting better and better with what’s available on the web. I never did embrace the internet with lots of enthusiasm–I always marvel that you’re so enthusiastic–of the internet, but I know it was a good and timely thing for my business. I’m winding down these days–since you’ve moved and since I don’t think it’s reasonable to expect my body to hold up for more than about 20 years (it’s been 17+), and since I’m mostly as busy as I’d like and since my income is stable (for now, finally), well… thanks for partnering with me. It was a great partnership. I enjoyed it and I benefitted. I think I was something of a disappointment since I’m not much a capitalist, but I’ve been really satisfied. It’s worth a whole lot to me that I’m satisfied. What’s next?? I’m not sure, but I expect I’ll be satisfied again! I’m glad for you that things are “falling together.” I”m not a bit surprised that it’s taken awhile. You’re a careful and thoughtful worker–no hurrying Pete Oakley! And you have a great product. Carry on, work hard and have fun!